Ah, can't you hear the music now? 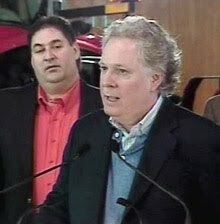 Premier Charest and his Liberals are in trouble in the polls and the PQ is waiting in the wings. So, what else is new? In this forty year long boomerang we call an election cycle in this blessed province,where every election is an existential crisis, can anyone be honestly surprised that two to three years from now the Parti Quebecois will probably be elected and that five years of economic stagnation will ensue? It's normal that political parties in power become tired, complacent and tempted. Corruption is probably the poison pill that the provincial Liberals will succumb to,and it won't matter that charges of judgeships being purchased by Liberal fundraisers (and their acolytes) stick or not. The smell alone will do. The problem here is that the alternative, the only alternative is one that beggars belief. Besides the Liberals and the PQ, no other viable political formation exists. Distrust the Liberals, hate them even, but to have no choice but to park your vote with a gang of quasi/serious (depends on the season) separatists because the rot at the top cannot be ignored is to contribute to the corruption of what little national identity we have left in this country - Canada, that is. What to do? Well, how about introducing a new political party here - federalist even! A real alternative. However, that will lead to a split of the anti-separatist vote thus ensuring many years of happy PQ ownership of Quebec City. That, combined with the permanent Bloc Quebecois presence in Ottawa, as Quebec's trusted representatives in the House of Commons, should ensure the inevitability of the continued decentralization of powers in favour of Quebec. And of course the more power Quebec appears to wield, the more Ottawa will attempt to appease. To buy and to give - in order to stay in the federation. This roller coaster ride will see the provincial Liberals in power again, of course. The PQ in government will be stabbed by the same knives. But does anyone think we'll live long enough to see where this will end? It scares me to think that our generation will be long gone with the final lines of the lyrics to this nationalist song still to be written.